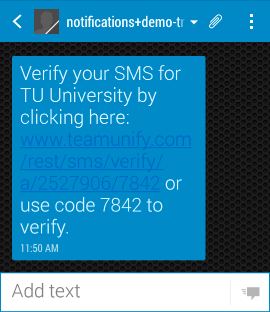 Adding and verifying your cell number is critical for your admins to send you alerts via SMS (text) messages. Without verification they cannot SMS (text) your number. Tap Menu > Membership > My Account. Tap UPDATE PROFILE at the bottom of the screen. Fill in SMS 1 or SMS 2 with the cell number and select your cell Carrier. Tap SAVE CHANGES and it will send a verification text to that number. Once you open the message it will usually verify your number, but tap the link just to make sure. If you have any trouble getting it to verify, try doing it through SwimOffice instead (see Verify SMS in SwimOffice).